The World Health Organization recently recommended a six – step technique for hand washing and applying sanitizer. New research demonstrates that the six-step hand-hygiene technique recommended by the World Health Organization is superior to earlier recommended three-step method of hand washing. Many of us aware of the fact, that we must wash our hands before and after our daily chores to keep ourselves healthy. You would have noticed however that there are people who after using toilet, bathroom, blowing nose do not wash their hands but will touch food or items in front of our eyes – yuk, it is disgusting!!. One should be aware of the science behind hand washing to understand why we need to wash our hands on several occasions – to keep not only ourselves healthy but also not to spread the sickness to others. Do you know that feces (or poop) of humans and animals are sources of several deadly germs like Salmonella, E. coli O157, and norovirus that cause diarrhea, and it can spread some respiratory infections like adenovirus and hand-foot-mouth disease. These kinds of germs can get onto hands after people use the toilet or in less obvious ways, like after handling raw meats that have invisible amounts of animal poop on them. When these germs get onto hands and are not washed off, they can be passed from person to person and make people sick. Do you know? A single gram of human feces—which is about the weight of a paper clip—can contain one trillion germs . If people touch the objects or food that has germs on it because of someone’s negligence or someone’s sickness then we become part of that vicious cycle of spreading germs knowingly or unknowingly. Knowingly because after observing someone not washing their hands and touching food and objects- then it becomes our responsibility to tell them to wash their hands. Read CDC’s instructions to understand when and how to wash hands. Removing germs through hand washing therefore helps prevent diarrhea and respiratory infections and may even help prevent skin and eye infections. When to wash our hands? 2. Right palm over back of left hand, interlacing gingers and vice versa. 6. Using fingertips do rotational rubbing in palm of opposite hand. Rinse you hand with water if you use soap. Washing hands with soap and water is the best way to reduce the number of germs on them in most situations. If soap and water are not available, use an alcohol-based hand sanitizer that contains at least 60% alcohol. Alcohol-based hand sanitizers can quickly reduce the number of germs on hands in some situations, but sanitizers do not eliminate all types of germs and might not remove harmful chemicals. Hand sanitizers are not as effective when hands are visibly dirty or greasy. If you are using hand sanitizer then follow the same six-step technique to clean your hands. 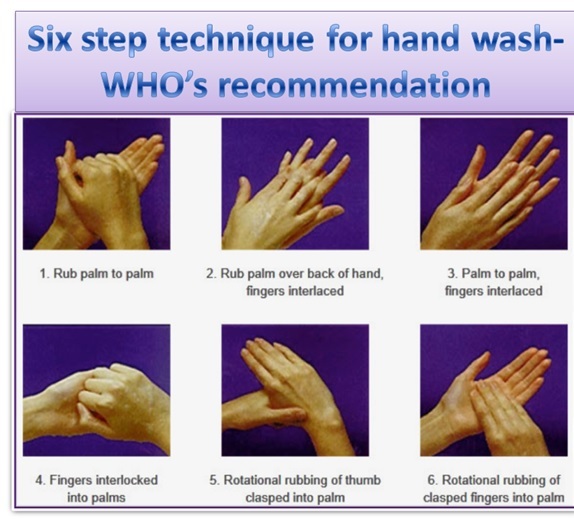 Suggestions: At home, work place or in other public places like restaurants – whenever it is necessary wash your hands. In restaurants if they don’t have soap – ask for soap to wash hands or carry a small soap in your handbag or keep it in your vehicle. If you see your coworker not washing hands after using toilet – gently remind them and do not hesitate. Keep a hand sanitizer in your purse or in your desk which comes in handy when soap is not available. Teach your children the importance of washing hands and give them examples about what happens if we do not take care of health of hands. Insist your family, friends and coworkers to wash hands to keep everybody safe and healthy.